A mild to moderate Santa Ana promises a hot, dry and windy rest of the week for San Diegans. Election Day in San Diego not only marks a historic election for the country, but also a mid-week warm up, where many residents will see temperatures in the 80s and 90s during a moderate Santa Ana. 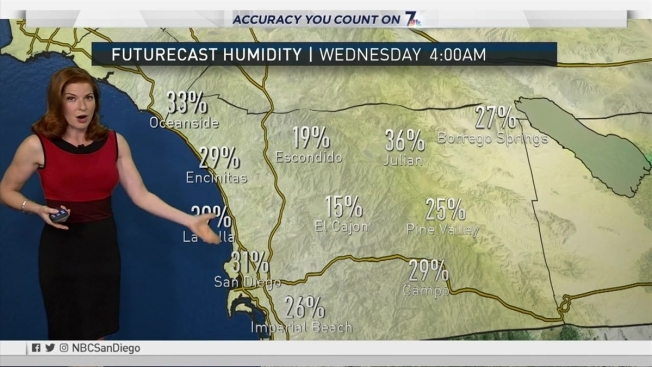 As San Diegans head to the polls on Nov. 8, temperatures will climb ten to 20 degrees above normal across the County, NBC 7 Meterologist Jodi Kodesh forecasts. Temperatures are forecasted to reach 81 degrees along the coast on Tuesday and 92 degrees inland, Kodesh said. Wednesday should be the hottest day of the stretch, Kodesh forecasted, with temperatures inland forecasted to reach 93 degrees and 86 degrees along the coast. By Thursday, temperatures should return to approximately 82 degrees along the coast and 89 degrees inland. During this mild to moderate Santa Ana, fire danger will be elevated because of rising temperatures, drier conditions and windier conditions. The County mountains and coastal foothills will see eastbound winds reaching 15 to 20 miles per hour, with possible gusts of 30 miles per hour, Kodesh said. Wednesday should be the windiest day and the driest day, Kodesh said, with winds at 15 to 20 miles per hour and gusts reaching 45 miles per hour. Friday will stay warm, dry and breezy, Kodesh said. Additionally, those heading to the San Diego beaches to enjoy the warmer weather should expect higher surf on Wednesday and Thursday, with swells reaching eight to ten feet. For your full forecast, click here.